The concentration of a multitude of service providers renders a high degree of competition in the global cloud based simulation application market, says Transparency Market Research (TMR) in a new report. To stay competitive, key players are striving to differentiate their service offerings and also add innovative functions and technologies to their existing services. In this scenario, partnerships, mergers and acquisitions are the sought after strategies for success that key players are resorting to. 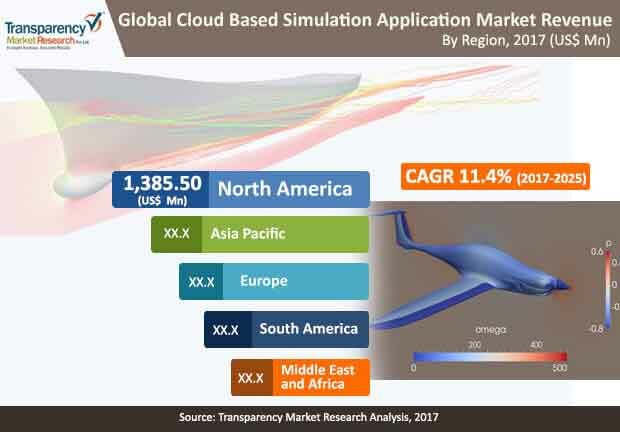 According to TMR, some of the key companies operating in the global cloud based simulation application market are ANSYS Inc., Autodesk Inc., Dassault Systemes, Exa Corporation, Fieldscale, MSC Software, Rescale Inc., Siemens PLM Software, SimCore Technologies, SOASTA Inc., and SimScale. According to the TMR report, the global cloud based simulation application market was pegged at US$3,259.8 mn in 2016. By the end of 2015, the market is projected to be worth US$8,451.5 mn progressing at a healthy 11.4% CAGR during the forecast period between 2017 and 2025. Based on solution, software as a service (SaaS) held the leading share of more than fifty percent in the overall market in 2016. By application, process improvement segment held more than 30% market share in 2016. Regionally, North America held the leading share in the global cloud based simulation application market in 2016. “Simulation software applications are used across a host of industry verticals for various functions,” says a TMR analyst. They are used to provide training, efficient use of available resources, and to predict process outcomes by enhancing process efficiency. Simulation software applications are equipped with inbuilt capabilities to measure, simulate, restructure, and manage risks. Due to this, simulation software applications enable users to deliver high quality products with shorter time to market. The rising demand for industrial automation also accounts as a key growth driver of cloud based simulation application market. The demand for cloud based simulation application has been on the rise from automotive, defense and aerospace, and manufacturing sectors over the last couple of years. Several companies are investing in simulation technology and its application with the objective of sustainable development which is expected to drive the growth of cloud based simulation application market in the upcoming years. For example, key players such as Dassault Systems, Autodesk, and Siemens PLM Software among others are focused on technological innovation to provide best web based simulation application which is contributing to the market’s growth. Apart from this, training, process improvement application are some other progressive areas that are anticipated to display a considerable demand for cloud based simulation application in the upcoming years. This is mainly because of increased accessibility via Software as a Service (SaaS) solution model. On the downside, insufficient technical expertise to operate cloud based simulation application is challenging the market’s growth. High complexities involved in cloud based simulation application requires critical programming capabilities. This makes it particularly difficult for first-time users to learn the designing process of cloud based simulation.